The Sacred Footprints series of talks was held at the University of Plymouth’s Sherwell Centre, between the end of April and the middle of June 2005. The first talk, ‘The Earth is Listening’, was given by the well-known Cornwall-based dowser Hamish Miller. Miller is a wonderfully understated celebrity. His delivery is soft and self-effacing, and, in common with all people who actually have something to say, he manages to drop profound notions into a sentence without added emphasis – just a little pause now and then to let the gravity of what he has just said sink in. He started his discussion with a brief introduction to dowsing for the benefit of those encountering a ‘real’ dowser for the first time – but he rapidly moved on to an overview of his two seminal works, “The Sun & the Serpent” and “The Dance of the Dragon”. In these books he and his colleagues recount the story of the rediscovery of some of the primary earth energy lines – firstly journeying across England from Cornwall to Norfolk (twice), then embarking on the remarkable expedition that took them from Ireland to Israel. His most recent work has been undertaken in New Zealand, where he has been working with local dowsers and sensitives to uncover similar energy manifestations in the New World. His work with the descendants of the Europeans, the Maori, and the few remaining pre-Polynesians has given new and fascinating impetus to his earth energy investigations. New book soon, Mr Miller? In a nutshell, the situation he found in both the UK and Europe – where energy imprints or interference patterns formed a variety of geometric shapes at significant meeting places of major energy lines – was also evident in the Antipodes. What he also found was that the shapes morphed over time and – most importantly – in response to being ‘activated’ by the dowser, shaman or sensitive. While this was already evident in the northern hemisphere, in the southern hemisphere it seemed significantly more dynamic. He has been drawn to the conclusion that the whole earth energy network is interactive with the investigator or pilgrim. Quite literally, the nervous system of the earth is aware and waiting. Even the experienced guru himself was drawn ‘raises the hairs on the back of his neck’. For a classic curtain-call, he measured the number of radial energy spikes emanating from a small energy centre in the lecture hall itself (a former protestant church nave). The radial count doubled from the start of the talk to the end – to the evident delight of both the audience and presenter himself. A few days later, on the first of May, and as part of the “Tavistock Sings Music Festival”, Hamish was back in town and in action at my home site – the ring, menhir and stone rows of Merrivale on Dartmoor. I arrived early (and 04.30 is early even for me) to count the radials at the circle, before anything had had a chance to disturb the natural balance. I dowsed 14. Unknown to me Hamish had been out the previous afternoon and counted 19. While dowsing and measuring other energies in the area, I noted that the radial count from the circle had already risen to 34, presumably as a result of my taking an interest. Long before the Beltane daybreak, figures began to drift up to the circle, distinguishable from the stones only in that they were moving (and some carrying torches!). By the time the scheduled activities were about to start, the radials were up to 80 and rising. The earth energy seemed to be engaging with the human attention. By the time dancer Hannah Silva had performed to the accompaniment of cellos and djembe, the count was over 90 and still rising. The All Change Choir gave a rendition of a Latin anthem and we sang a couple of chants – strangely atmospheric in the early morning stillness – while skylarks and a cuckoo kept up their own song-lines. By now, the radial count was over 100, but levelling off. There was a short ceremony heralded by a Cornish bagpiper, followed by two circle dances – one European, the other African. After much socialising, and some discussion about dowsing, the group dispersed, leaving just the dowsers to be first in and last out. Measuring again a little while later, the circle remained active, but stable, at around 90 radials and, as the rising sun was gradually shrouded in Dartmoor summer drizzle, we headed home for that rare English delicacy, the vegetarian cooked breakfast. As a ‘control’, I counted the radials emanating from the nearby menhir. At rest, there were 9. These rose to 18, by the time the event was under way, but stayed there. 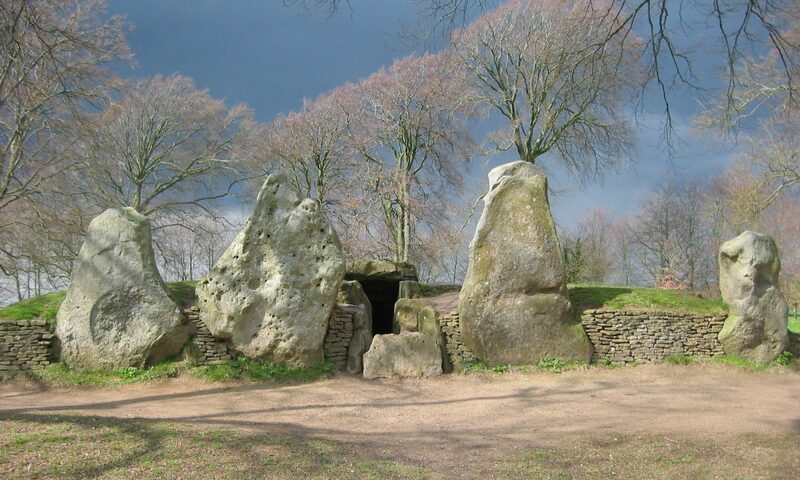 This rise could have been due to my own activities or those of the various children, tourists and dog-walkers walking round and touching the stone – or perhaps it was due to the energy line linking the two sacred sites. Either way, the width of that line stayed stubbornly 8 paces wide, indicating to me that the former was mostly involved. The following afternoon, I revisited the site, where just a few day trippers were capturing their last digital images, before embarking on the quest for a cream tea. As I dowsed about, checking this and that, the circle slowly moved up to 26, but stopped there – as if the earth had opened one eye, saw it was only me again, and parked itself in standby. It may have been listening, but I had nothing further to say. The sanctity of the event may have been a bit mixed, but, as the energies displayed, the intent was uplifting and positive. The output for the dowser was unequivocal – earth energy is interactive. Many thanks to Hamish Miller for a quietly inspirational presentation – and to Caroline Keane and the organisers of the “Tavistock Sings Dawn Chorus” for arranging the early morning May Day event.